Alexander Paul Kapranos Huntley (born 20 March 1972) is an English-born Scottish musician, singer, songwriter, record producer, and author. He is best known as the lead singer and guitarist of Scottish rock band Franz Ferdinand. He has also been a part of the supergroups FFS and BNQT. Alexander Paul Kapranos Huntley was born on 20 March 1972 in Almondsbury, Gloucestershire, the son of an English mother and Greek father. As a 2-month-old he moved to Sunderland, moving to Scotland when he was 7. He attended the University of Aberdeen to study Theology. After dropping out, he continued studying at the University of Strathclyde, gaining a BA. In 2005, he was awarded Strathclyde's Alumnus of the Year. Kapranos worked as a chef, barman, music promoter, driver, welder, and IT lecturer prior to finding fame. From the early 1990s, he was a fixture of the Glasgow music scene, running live nights at The 13th Note Café, most notably The Kazoo Club. While working at the city's Anniesland College, he played in some of Glasgow's popular bands, including The Blisters (later known as The Karelia), The Amphetameanies, and The Yummy Fur. He is also known to have contributed to the noise act Urusei Yatsura and Lung Leg recordings. After dropping "Huntley" from his name, Kapranos formed Franz Ferdinand in 2001. The band was composed of Alex Kapranos, Nick McCarthy (guitar, keyboard, backup vocals), Paul Thomson (drums, backup vocals, sometimes guitar) and Bob Hardy (bass). The band saw chart success after their second single Take Me Out was released on 12 January 2004 and reached Number 3 in the UK Charts followed by their debut album Franz Ferdinand (released 9 February 2004) which debuted on the UK album chart at Number 3. The band went on to win the 2004 Mercury Music Prize and two Brit Awards in 2005 for Best British Group and Best British Rock Act. In 2015, the band collaborated with American band Sparks to form a supergroup named FFS. Kapranos produced Men's Needs, Women's Needs, Whatever – the third album by British indie rock group The Cribs in Vancouver BC, released on 14 May 2007. He also produced their single-only track, "Don't You Wanna Be Relevant? ", which was featured with "Our Bovine Public" (from Men's Needs, Women's Needs, Whatever) as a double A-side. Kapranos makes a cameo appearance in the video for Our Bovine Public. His remix of the single "New in Town", by British pop singer Little Boots was featured on various formats of the singles release. He produced the debut album by British indie rock band Citizens! – Here We Are, which was released by Kitsuné on 28 May 2012. He produced the second album of Scottish guitarist RM Hubbert, Thirteen Lost & Found. In September 2005, Kapranos began "Soundbites", a weekly food column for G2 in The Guardian newspaper, which detailed his culinary adventures as Franz Ferdinand traversed the globe on their world tour. Sound Bites: Eating on Tour with Franz Ferdinand, a book of the column and unreleased material illustrated by Andy Knowles was released in 2006. Sound Bites: Eating on Tour with Franz Ferdinand was read by Kapranos on BBC Radio 4's Book of the Week for 4–8 December 2006, described as "his account about what he ate while touring the world." Kapranos narrated the 2008 BBC Scotland documentary Edwyn Collins: Home Again on the recovery of Orange Juice singer Edwyn Collins. Also in 2008, Kapranos narrated the BBC Radio One documentary The Story of Kraftwerk. In 2016, Kapranos took part in a documentary about Glasgow music, and Chemikal Underground Records, called Lost in France. The film was directed by Niall McCann and brought Kapranos (along with members of The Delgados, Mogwai and others) to Mauron, Brittany, to recreate a gig they played when Kapranos was in his earlier band, The Karelia. The film features Kapranos playing live with Stuart Braithwaite of Mogwai, and other musicians such as Emma Pollock and RM Hubbert, and Holy Mountain, as well as interviews with Kapranos and his old label-mates. Lost in France premiered at the Edinburgh International Film Festival to wholly positive reviews and was called "Funny, vital and sobering” by Scotland's arts bible The Skinny. In his spare time, Kapranos enjoys crafting abstract furniture in his carpentry workshop. 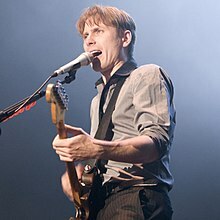 In June 2005, Kapranos was detained for around an hour by officials at Domodedovo Airport in Moscow after being mistakenly identified as belonging on a U.S. "no-fly" list. This occurred due to the surname on his passport, Huntley, also having been previously used as an alias by the former MI6 agent Richard Tomlinson. Tomlinson had been fired, imprisoned, and labelled a security risk after circulating to publishers a draft of a book on MI6. Kapranos was released after officials determined that he did not fit Tomlinson's description. ^ Walters, Barry (26 August 2013). "Franz Ferdinand's 'Right Thoughts, Right Words, Right Action' Is a Marvel of Relaxing Tension". Spin. Retrieved 3 February 2014. ^ Neil Scott. "The Mind's Construction Quarterly » Alex Kapranos". Tmcq.co.uk. Retrieved 5 November 2011. ^ "Franz's Alex comes home to Sunderland". Retrieved 25 July 2018. ^ Bromwich, Katheryn (11 February 2018). "On my radar: Alex Kapranos's cultural highlights". www.theguardian.com. The Guardian. ^ Battaglia, Andy (14 February 2007). "Alex Kapranos of Franz Ferdinand". The A.V. Club. Retrieved 30 June 2017. ^ ""Music Charts: "Franz Ferdinand – Take Me Out"". Acharts.us. Retrieved 27 September 2014. ^ ""Music Charts: "Franz Ferdinand – Franz Ferdinand"". Acharts.us. Retrieved 27 September 2014. ^ "Ferdinand win Mercury Music Prize". BBC News. 8 September 2004. Retrieved 5 November 2011. ^ Kaufman, Gil (10 February 2005). "Franz Ferdinand, Scissor Sisters, Keane Win Big at Brit Awards". Mtv.com. Retrieved 5 November 2011. ^ "The Cribs – Our Bovine Public". YouTube. Retrieved 5 November 2011. ^ "Citizens! debut album "Here we are" announcement". Kitsuné Journal. Archived from the original on 11 June 2012. Retrieved 22 November 2012. ^ Kapranos, Alex (23 September 2005). "Whine tasting". The Guardian. London. Retrieved 23 April 2010. ^ "Radio 4 Programmes – FM Schedule, Saturday 5 November 2011". BBC. 31 October 2011. Retrieved 5 November 2011. ^ Marianne Dowling (23 November 2009). "CANOE – JAM! Music – Artists – Franz Ferdinand : Franz Ferdinand keeps it interesting". Jam.canoe.ca. Archived from the original on 10 July 2012. Retrieved 5 November 2011. ^ Fielding, Nick (19 June 2005). "Russians hold Franz, the MI6 rock agent". The Sunday Times. Retrieved 9 December 2016. ^ "ON THIS DAY: June 2 – Queen Elizabeth was coronated 62 years ago today". North Devon Journal. 2 June 2015. Archived from the original on 25 December 2015. Retrieved 1 November 2016. Wikimedia Commons has media related to Alex Kapranos.